El Portal Sedona Hotel ~ Upcoming Events for the Sedona Area! 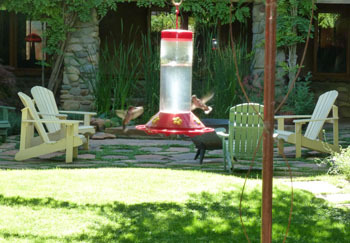 Don’t forget the First Ever Hummingbird Festival is to take place this weekend, August 3-5th! The festival will include a Gala Banquet, presentations on gardening, science, photography, and conservation, a Hummingbird Garden Tour, the Hummingbird Mall, Hummingbird Sunrise Breakfasts, banding demonstrations, hummingbird hot spots and more! Click here for tickets email questions to info@hummingbirdsociety.org. Visit 25 galleries and studios throughout this charming mountain town from 5:00-8:00pm Friday August 4th. A free shuttle runs during the walk, from the newest studios at The Old Jerome High School up to Main Street and the gallery of Patrick Lincoln and Made in Jerome Pottery at the top. With debuts of new designs from local artists, jewelry work, sundresses, beadwork and more, come and savor the art and artists of Jerome! Sedona residents and visitors are invited to join thousands of other communities nationwide in celebrating the 29th Annual National Night Out with safety presentations and a free community picnic on Tuesday, August 7, 2012 from 6 p.m. to 8 p.m. at the Posse Grounds Park, Posse Ground Road. National Night Out is designed to increase community involvement and strengthen partnerships between the community and local public safety agencies. There will be free food, water and snacks, with live demonstrations, live music and a wide range of information on public safety topics. Those attending can have children fingerprinted for free, see the latest in law enforcement, firefighting, safety and rescue equipment, learn ways to make their homes and streets safer as well as meet community public safety officials. Visit Sedona and take in all the fun! Make El Portal Sedona Hotel, a pet friendly Sedona hotel, your home base for a few days and experience this beautiful part of the country. Guests of the luxury boutique hotel have access to unique concierge services for Sedona and area, we will do everything we can to ensure you have a wonderful Sedona Arizona vacation! Call 1.800.313.0017 for reservations. Check out our Sedona hotel specials! we are thinking of coming to Sedona this late October. Could you be so kind as to inform us if the area affords any particular events and festivals at that time? Also could you please let us know which is your top suite and the cost per night. Thank you for your assistance. In late October there is the annual SEDONA PLEIN AIR FESTIVAL- The Sedona Arts Center hosts this annual event celebrating painting in open air and featuring many of the country’s finest plein air artists. sedonaartscenter.com (928) 282-3809. There are weekly musical performances during the entire month as well. Sedona offers visitors a multitude of activities: hiking, biking, wine tours, jeep tours, hot air balloon rides, museums and more. Our top room is the Governor’s Suite (room 12) available at $359/night. For additional information please call toll free 1.800.313.0017.